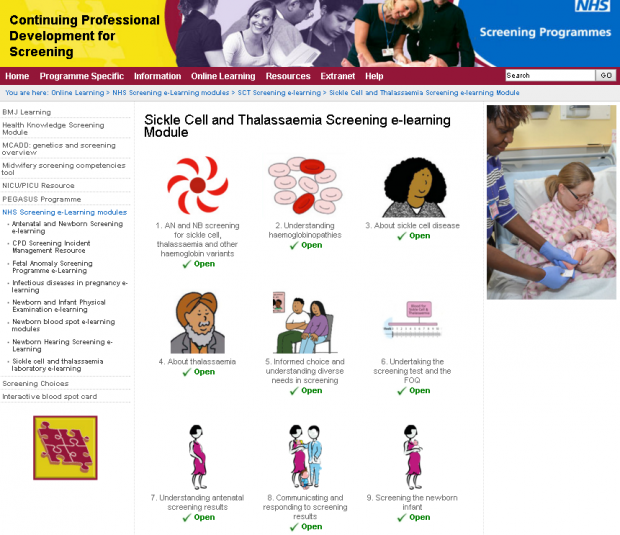 We (the NHS Sickle Cell and Thalassaemia Screening Programme) are pleased to announce the launch of our new e-learning resource on the CPD website to support greater understanding of the programme, the conditions screened for and how they can impact on individuals and families. A promotional video embedded in the CPD site explains more about the e-learning resource and how it was developed. The resource is interactive and incorporates film clips and animations. It offers insights into good practice from practitioners and parents and signposts to a range of freely available resources which highlight the challenges of offering screening for haemoglobinopathy disorders. The resource consists of 10 stand-alone units and has been designed to enable you to focus your learning by accessing the individual units relevant to your clinical needs, or particular interests. Each unit should take about 15 minutes to complete. Each unit offers optional multiple choice questions (MCQs) so you can test your knowledge. On successful completion of the MCQs you can print off a certificate for your CPD portfolio. Clear, well set out, short learning sessions that could be done quickly. Very easy to access information and build up learning over time. I liked the use of short films. … the repetition helped me learn. The bullet points aid learning as I find it easier to remember short points. The information is clear. I think it's an excellent resource for student midwives, community midwives and antenatal clinic midwives as well as screening specialists. It could also be useful for nurses and health visitors (and students). Very useful resource, consolidated my knowledge. The add notes function was very useful. It would be useful if this will be able to be accessed during the test as the whole module contains a lot of detailed information and stats which would be difficult to remember. Easy to follow, good background information about the conditions screened for. Good that resource can be dipped in and out of. The videos are a great way for me to learn and understand, especially when they are describing how to deal with people.